Davao City offers some of the most interesting religious buildings and boutique museums found anywhere around the Philippines. 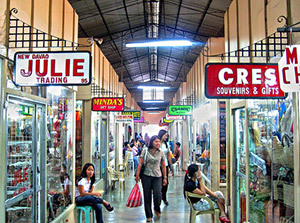 Davao City also offers some of the most unique shopping experiences, with curios and handicrafts derived from one of the most diverse mixes of indigenous cultures found anywhere on the planet. For a busy day out and about, the Travel Davao City Explorer Museums Tour provides a colorful introduction to Davao's heritage and cultures. 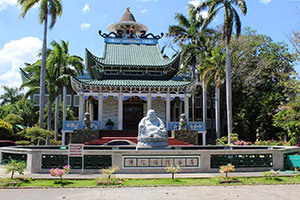 Lon Wa Buddhist Temple (sometimes Long Hua) is a must-see tourist attraction in Davao City. It is one of the largest Buddhist temples in the Philippines, certainly the largest in Mindanao and the most popular temple in Davao City. The Lon Wa Buddhist Temple is located in the Agdao District, some four kilometers northeast of Davao City center. Lon Wa translates to "Temple of the Dragon" and is home to Kung Fu monks and nuns of the Philippine Academy of Shakya (a Buddhist religious movement). Many Chinese tourists and migrants visit this place to worship and pay respects, while other tourists come to marvel at the temple walls laden with slabs of Italian marble and the grounds beautifully landscaped with the lush greenery of several varieties of flowering plants and palm trees. With over 700 specimens, D'Bone Collector Museum has one of the largest collections of bones, skulls, and skeletons in the country. 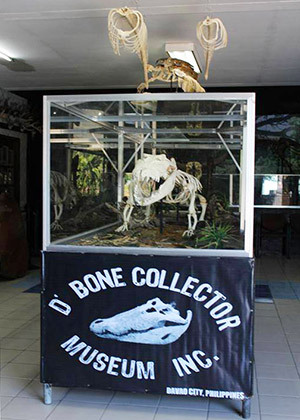 The D'Bone Collector Museum is the first of its kind in Davao City, if not in the Philippines. The bones and skeletons of animals come not only from the tropical rainforests, but also from the seas and oceans. American Darrell Dean Blatchley, the president and curator of the D'Bone Collector Museum, started collecting bones during his teens. His fascination with bones made him discover that there's more to an animal than just meat; equally important are the bones. His collection grew as the years went by until it seemed they could already fill up a museum – so that's what he did. 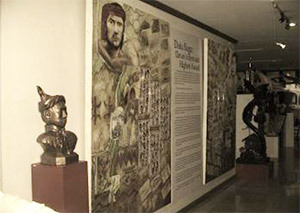 The Museo Dabawenyo (museum of the peoples of Davao) is one of the divisions under the City Mayor's Office of the City Government of Davao and as established in 2006; Museo Dabawenyo is being managed in collaboration with the private sector. It is designed to be the "People's Museum" and its programs are geared towards improving historical and cultural awareness, understanding and integration. A new installment in the city's contemporary art scene, the Kublai Art Museum and Davao Contemporary Art Gallery is a unique cultural expression of Davao's visual artists. 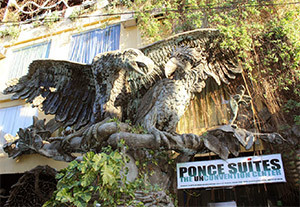 The museum showcases various works by Mindanao's most famous artist Kublai Ponce-Millan, known for his giant sculptures; Kublai is also a photographer, painter, digital artist and performing artist. The integrated Davao Contemporary Art Gallery includes works from a selection of other aspiring artists of Davao City. For your dining pleasure Penong's Barbecue has earned the reputation of being the one of the best in the country and popular for its unlimited rice - the very first one to introduce it to the market. Penong's Barbecue provides customers a savoring experience by not only offering the best grilled barbecues but also choices of meat, fish, seafood and vegetables. Known as very affordable but with the highest quality, and served in the most excellent way. Before heading back to the City a there will be a stopover at the Apo ni Lola pasalubong center located at San Miguel Village, Matina, Davao City. 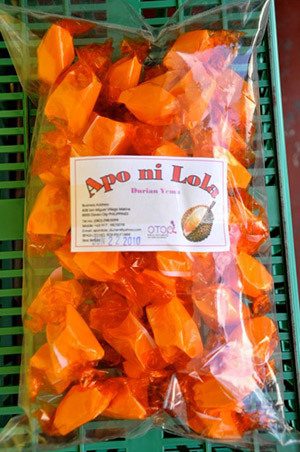 Apo ni Lola sells a variety of Durian candies ranging from yema to mallows to tarts, and some even have a certain twist to it, for example there is a Durian Mocha Yema or Durian Cookies and Creme Yema. They also have other fruits made into candies such as Mangosteen and Langka. At the entrance to the Apo ni Lola factory, they give out free tastes of their goodies. The Aldevinco shopping center houses tiny shops selling native handicraft, garments, fancy jewelry and collector items (antiques, brassware, indigenous musical instruments, etc.). Confirming Davao's rich trading history with other ASEAN countries, the garments available at Aldevinco are mostly made from Indonesian or Thai cloths, but native fabric (like t'nalak of the T'boli) are also available, although in steady declining quantity. The Davao City Explorer Museums tour package is a full day event, finishing with a shopping expedition in the heart of the Davao City. Travel–Davao make sure you get to the starting point on time and make sure you get safely back to you hotel / resort in Davao City. You will want to bring a camera or mobile phone with a high pixel image unit and probably some spare cash to purchase some pasalubong (gifts).